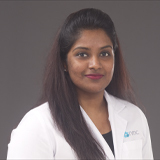 Dr Sruthi Ramachandran is a General Practitioner hailing from Kerala, India, with Bachelors in Medicine and Surgery in 2013 from K.V.G Medical College Karnataka, Rajiv Gandhi University of Health Sciences Bangalore. Prior to working with NMC she has 3 years’ work experience in a well-advanced Emergency and Trauma Care Department of Lakeshore Hospital and Research Center, a NABH accredited Tertiary Superspeciality Hospital in Cochin, Kerala, India. House Job completed at Government Hospital Trivandrum Kerala and Woman and Children Hospital Thycaud, Trivandrum, Kerala. Experienced at Acute Management of Medical and Surgical Emergencies. Well acquainted at quick assessment, immediate diagnosis and effective management of acute and critically ill patients presenting at the department. Handled in numerous amount of Medico-Legal Cases, such as road traffic accidents, homicides, assaults, and suicides. Managed Poisoning Cases, Snakebite Cases and Burns of various Degrees. Successfully managed various challenging cases which required extensive care and patience. Possess good analytical skills, people management skills. She is also ACLS certified.